These are prison sporks from the now closed Essex County Jail Annex in North Caldwell, NJ. I liked the orange color against a black background. It's not a fancy shot, but I figured there may not be a lot of sporks - so I went for the unique route. I set the spoons on a black background, and kept moving them around. I liked the simplicity of this the best. PP was limited to cropping, hue/sat adjustment, and resizing. Yes, there are some right side up and some upside down. It was done intentionally, thought it would change it up from a standard line up. My eye is drawn through the photo well with these, and I can't deicde if they are face down or face up! At first glance it doesn't seem like much, but it is very interesting to look at for a while. Nice soft plastic, I assume? Not suited for digging tunnels. They make a nice pattern, though it could be just a bit sharper for impact. 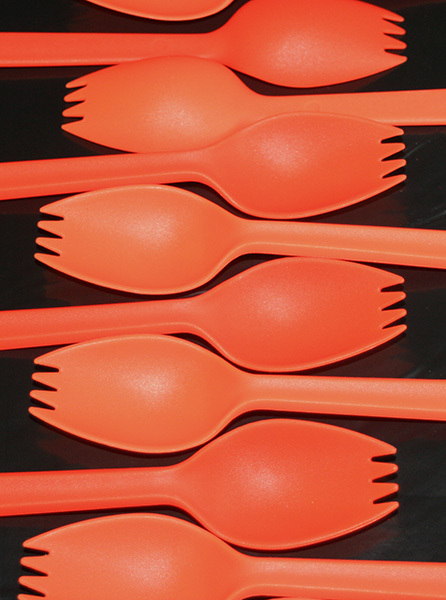 I wish there was a little more black/even spacing between the sporks. a nice change of pace from all that metal! Proudly hosted by Sargasso Networks. Current Server Time: 04/20/2019 01:07:37 AM EDT.